Its been three years now and I can say that Thanksgiving has become a part and parcel of our holiday tradition. The spirit of the holiday season is so strong, it simply seems worthless to resist. Those of you who have followed my earlier posts might be knowing that last year, on the very day of Thanksgiving, I couldn’t move and had to be rushed to emergency because of a strained back. So, to me, Thanksgiving is a great time to remind ourselves to take nothing for granted, take the time to reflect, count our blessings and to see the glass as half full. Thankful I am, for being able to do what I love, for the love and support from all of you, for my wonderful family and circle of friends, lovely neighbors or even the simplest of the things like bright sunshine on cold days and my little girl’s tiny hands hugging me as she says “I love you, Amma”. We usually have an Indian themed Thanksgiving feast including root vegetables, cranberries, pumpkins and the like, to accentuate the elaborate meal. The day itself is laid back with emphasis on togetherness and family time while savoring every moment! After much indulgence in a bunch of sweets from Ellu Unde, Coconut Badam Burfi and Walnut Date Burfi in a row, it is time the blog showcases something opposite, something savory, palate cleansing, tangy and spicy! And now that Thanksgiving is almost here and cranberries are in season, don’t you think it is the perfect time for this Cranberry Thokku? I started cooking cranberries only since last year. Unlike Blueberries, Cranberries are light for their size because they are hollow and devoid of any pulp or juice inside. For the same reason, they are easy to cook. If they pop, consider them halfway done. Eaten raw, they are a mix of tart and sharp with a hint of sweet and a slight bitter after taste. Pretty with a candy like color, shiny and smooth, they are a tiny sensory package. All of us know how good Cranberries are for the heart. Did you know? They are effective in easing as well as preventing Urinary Tract infections and reducing the formation of dental plaque and gum disease in turn? Another reason to add this recipe to your repertoire and not just for holiday cooking. Now what’s this funny sounding “Thokku” you may ask? Thokku [ Tho kkoo ] is in between Thogayal (chutney) and Oorugai (Pickle) in Tamil. A spicy condiment, it is a chutney devoid of coconut, sautéed in oil long enough to remove all moisture content to extend its shelf life. It is almost always tangy made with characteristic ingredients like tamarind or mango, fenugreek seeds and green chillies. To tell you in a nutshell, trying to recollect the taste of Thokku gets me salivating without fail! Simply enjoy mixed with hot steamed rice and a drizzle of ghee or your favorite oil as the first few morsels of your meal. It stimulates the palate. My mouth is watering…. I always make sure I have some kind of savory chutney/spread on hand because it saves me on those busy or lazy days when I can’t cook a side dish. Same here. I have a special soft corner for savory relishes. Love starting my meal with one of those! This looks amazing. 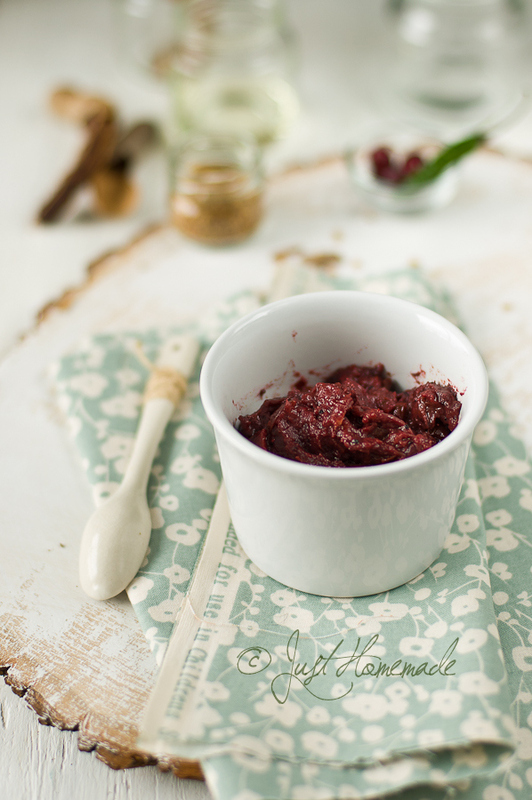 I love cranberries and a fresh cranberry relish. I am one of the few that enjoys fresh cranberry sauce at the table and not out of the can! One question, what type of green chilies did you use? Were they dried? I agree. Nothing like fresh! Green chillies are fresh too, not dried. That would be Thai green chillies in the grocery store or anything similar, for their heat. Great recipe! and Beautiful clicks. 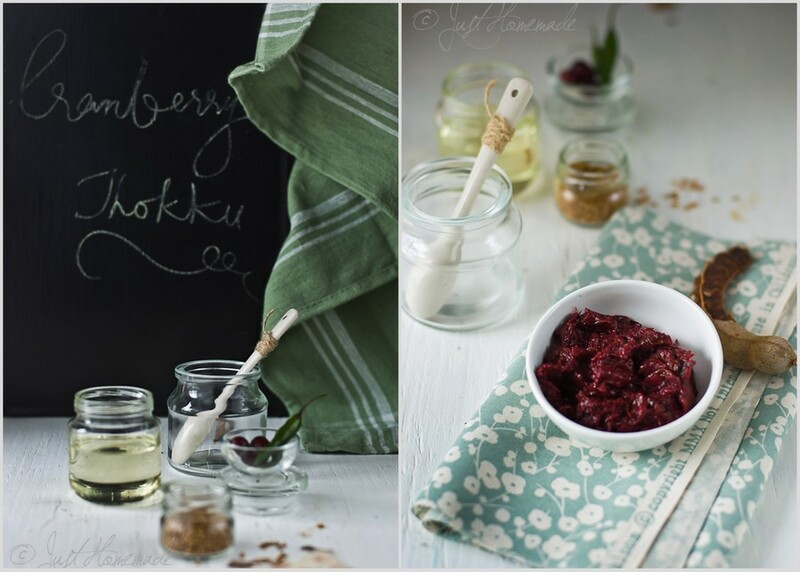 Your cranberry thokku looks delicious and would be the perfect accompaniment for thanksgiving leftovers. The thought of the sharp tangy flavour of the cranberries, brought out with the tamarind, together with the heat from the fresh chillis served with a bit of leftover turkey sounds incredible. A wonderful new way to use cranberries this season! 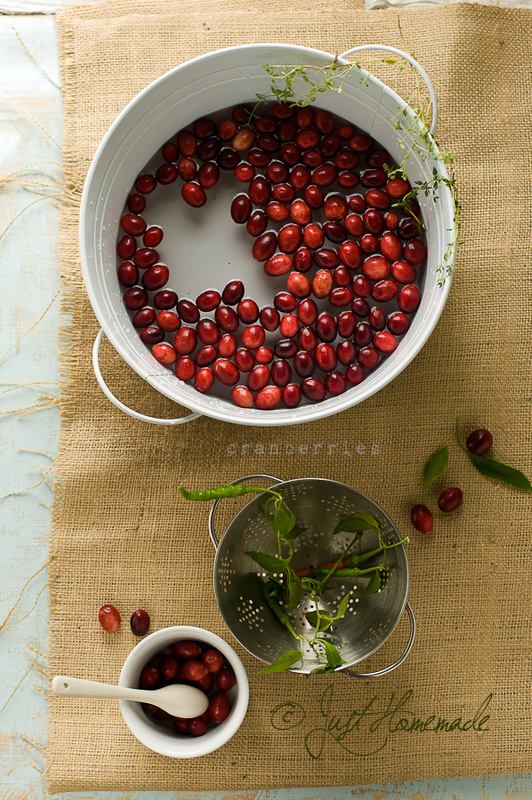 Yummy recipe to highlight cranberries at its best! Very tasty, this took less than 40 minutes to make, and is delicious! I used sesame oil instead of peanut oil and the idea of using green chilies makes an outstanding recipe. I love your recipes, the clarity and the lovely photographs make me want to try them out instantly. thank you so much. Do stop by my blog when you get the time. I just made this thokku and the result is delicious. It is tangy, sweet and spicy all in one mouthful. I substituted olive oil with a splash of mustard oil and used 8 thai green chilies . Had no jaggery, so I used dark brown sugar. This will become a Thanksgiving staple in my house. Thank you and happy thanksgiving ! Hi ,Loved your blog and your cranberry thokku. I have a small business – Nature In A Bottle ,in Bangalore,India. I made a different version of cranberry pickle for a gift hamper and forgot to spare some cranberries for the picture. I am not able to source them easily in small quantities . So I was wondering if I could use one of your pictures in my FB page and my website with due credits to you ofcourse . Here is my website and FB page.